When is a jam band not a jam band? When it’s a progressive-funk band, of course! Or a jazz-funk band. Or a reggae-rock-hip-hop-jazz-fusion- klezmer-polka-swing-flamenco-funk band. Or a . . . well, you get the idea. As the term “jam” has become something of a four-letter word, more and more bands attempt to mask their noodly inclinations with hyphenated genre descriptors. 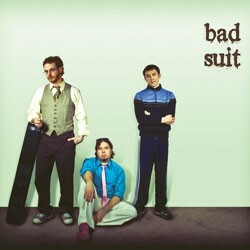 But in the case of Burlington’s Bad Suit, “prog-funk” is anything but subterfuge. Rather, it’s a fitting description of the inventive blend of instrumental rock found on the trio’s self-titled studio debut. When is a jam band not a jam band? When it’s Bad Suit. The disc gets underway with “Gooseneck Appendage,” fueled by a swirling opening guitar riff courtesy of Kevin Stevens and doubled by bassist Alex Budney. The tune sets a laid-back but driving groove, ultimately giving way to a nifty double-time bridge. Under the precise polyrhythmic command of drummer Tim Sharbaugh, the band alternates between the two feels several times before bringing it all back around to close on the opening riff. “Wrong Way Gone” begins as a meandering, low-key, guitar-driven affair, with Budney quite literally chiming in with tasteful bass harmonics. But as quickly as the listener settles into the tune’s playfully ethereal textures, the band unceremoniously switches gears, math-rock style. I spent a good 20 minutes trying to figure out the time signatures here and I’m still stumped. It’s deceptively intricate. Thankfully, for meter-challenged folks like myself, the band closes out the tune with a good old-fashioned 4/4 romp. As previously noted, Bad Suit labels itself as “progressive-funk” and, more than any number on the disc, “Inside Out” bears out this designation. Generally, the band falls on the proggier end of the spectrum. But here Budney becomes unleashed, laying down some seriously funkified bass lines. True to form, the players once again mix it up structurally. This time it turns into my favorite moment on the disc, as Stevens delivers a series of lines recalling the psychedelic surf ramblings of The Mermen. “Levanter” is the jammiest cut on the record and my least favorite. Where the previous tunes — and album closer “Sometime” — find the band exhibiting tactful taste and restraint, here we get an earful of wah-pedal wankery. Call it a personal bias, but the song does a disservice to an otherwise fine recording. This Friday, Nectar’s hosts a double dose of CD releasin’ as Bad Suit teams up with Japhy Ryder, celebrating the release of their latest, No Consequence.